Threats to personal safety can happen anywhere, anytime. Every day we carry items that can be employed as improvised weapons and shields. Often times there are objects in our immediate environment that can also be used in this way. This 4 hour seminar will teach you how to use common objects you carry or can grab nearby to defend and counter attack a violent assailant. Krav Maga teaches simple, direct actions that can be applied creatively. Umbrellas, canes, purses, shoulder bags and backpacks can come in handy for more than their intended purposes. Blocking strikes and delivering counter attacks with these sorts of objects is simple but takes some practice. 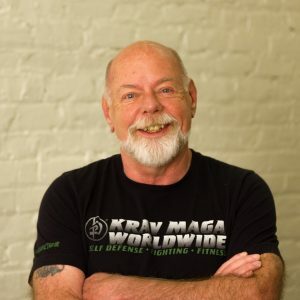 Krav Maga Black Belt Barny Foland will show you how to grab and use everyday objects for use in self defense situations. You’ll be amazed at how many items you might have on you already, or can quickly pick up nearby that can save you from injury or worse. This seminar is open to all levels. Whether you are a seasoned Krav Maga practitioner or beginner, you are sure to learn something new, useful, and empowering! This course was amazing! I know now that no matter your size or stature, you can learn techniques to be in control of any situation.